Thriving may be defined as the joint experience of vitality and learning. It is a marker of individual growth and forward progress. As a result, thriving can serve as a kind of internal gauge that individuals can use to assess how they are doing in terms of their well-being at work. We review findings regarding thriving including key outcomes and antecedent conditions. Given the focus of this volume on self-determination theory, we articulate how thriving may be nurtured from the nutriments of self-determination. All three nutriments of self-determination – a sense of autonomy, competence, and belongingness – facilitate more thriving at work. 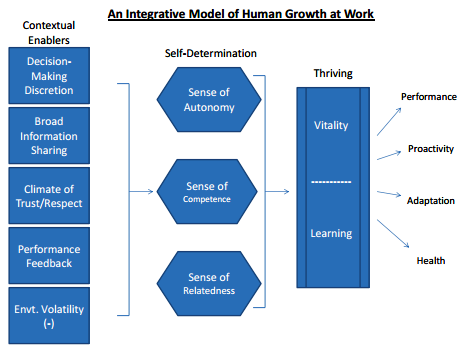 To this end, by linking self-determination and thriving, we can build a more integrative model of human growth at work.